Friday 16th August is probably not a date that means much to fans of the Premier and Football League, but this season it was the date where the first travelers started on the very long road to Wembley. 737 clubs have entered the competition this season and it will be a fair few months before most football fans realise the tournament has actually started. In fact, just two weeks ago I had one of those conversations with a fan of a Premier League club who genuinely asked me whether Lewes had applied to be in the hat for the First Round draw of the FA Cup. So after finishing last season’s tournament as part of The Dream, the marketing campaign run by official tournament sponsors Budweiser, I was back, 97 days after being at Wembley and just 11 miles to the east in White Hart Lane. 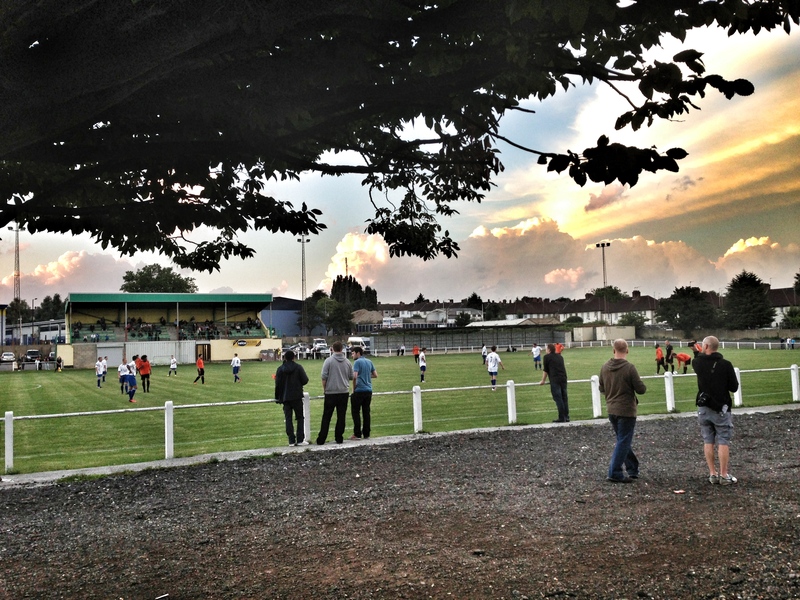 Not THAT WHL, but Coles Park, White Hart Lane, London N17, home of Haringey Borough FC. Except I wasn’t here to see the landlords play. Instead, tonight the ground would host the Extra Preliminary Round game between Enfield 1893 and London Tigers. Enfield’s ground still wasn’t ready for football, so fellow Essex Senior League side Borough offered the use of their facilities. They do that sort of thing in Non League football you know. As I programmed the destination into the Sat Nav it obviously tried to direct me to the other White Hart Lane. Week in week out, travelling Premier League fans must arrive at Coles Park wondering what has gone wrong. Oh how the club officials must laugh – those long winter nights must just fly by in these parts. The official on the gate as I drove in reminded me I wasn’t going to see any “Spurs” tonight and chuckled to himself. I handed over my six pounds and drove on. Coles Park is one of those grounds where you can park up and stay in your car and watch the game. I thought about it, listening to the commentary on 5 Live or TalkSport but having seen the players warming up, I soon realised that I wasn’t safe and moved the car to the corner of the car park. Beer procured (sorry, no Budweiser – a marketing faux pas) and I met up with the Real FA Cup team who were bemoaning the wrong choice of camera lens. Amateurs, eh. The winners of tonight’s tie would face the daunting trip to the winners of the tie taking place 20-odd miles up the A10 between Hoddesdon Town and St Margretsbury. There are no easy games at this level, as Shearer will tell you. Enfield 1893 were firm favourites. If I was allowed, I would have placed a tenner on them. Alas, the FA rules deem that because I hold an official position as a Director of Lewes FC I cannot bet on any game in the competition. Not quite sure how I could in any way unduly influence the game, but that’s the FA for you. Enfield 1893 were formed out of the ashes of Enfield FC, one of the strongest Non League sides back in the day and once on the verge of a place of the Football League. After the club’s implosion, they were one of the two pheonix’s that rose from the flames. During the close season at the end of the 2006–07 season, Enfield had no choice but to liquidate due to the debts owed to the inland revenue by former chairman Lazarou, forcing the club to resign from the Isthmian League Division One North. Enfield Town F.C. approached Enfield F.C. 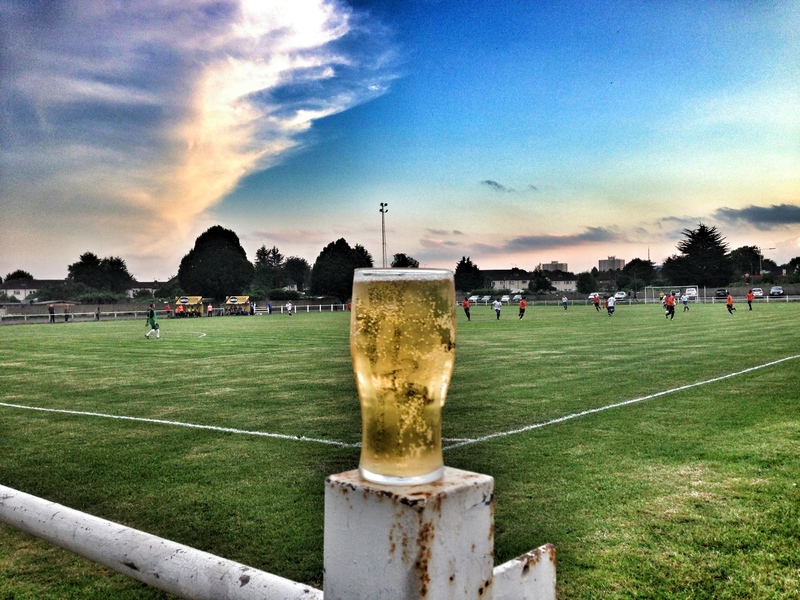 proposing a merger, but the Enfield F.C. officials opted to remain a separate club, form a new club named Enfield 1893 F.C. Enfield Town are now playing in the Ryman Premier League, although 1893 will feel hard done by that they were also denied a place in the Isthmian league two seasons ago after winning the Essex Senior League due to those pesky ground graders. Enfield 1893 0 London Tigers 0 – Coles Park – Friday 16th August 2013 So they have to do it all again next week. Some of the cynics in the crowd, and there was a few, would say they did it for the additional gate money but in truth Enfield had one of those nights. I’m sure if we could find the OPTA stats from the game, their shots total would nearly be in three figures, but as their manager eloquently shouted in the first half “You can’t hit a barn door with a bloody barn!”. It was a game of niggles, petty fouls and lots of puff (in a effort not drug sense). Enfield were reduced to ten men in the second half after a strong tackle reduced a Tigers player to a crumbled screaming heap on the floor. Normally such antics are a thing reserved for the professional game and the Tigers player should be ashamed of his over reaction which was very quickly run off. However, there was never going to be a fairy tale ending for the Tigers, formerly Kingsbury FC for those confused, and they could go on their journey back around the North Circular licking their wounds and knowing they could have another bite at Enfield in midweek. There, I’ve got the tiger gags out of my system. Not quite the explosive start we would have hoped for from the (refers to official guidelines sent by the FA), the world’s oldest domestic cup competition. Perhaps the highlights on TV will make it look a bit more exciting.